USDA Refused to Admit Which Pharmaceutical GM Crop Escaped Test Fields and Has Been On the Loose Since 2002! Yesterday on the Alex Jones Show, Alex addressed genetically-modified, Big PHARMA crops carrying the AIDS virus in corn circa 2002. Clearly, biotech, the military, other entities have been dangerously experimenting on the public without consent for some time. But is something so out of control and unregulated as growing the AIDS virus really going on? Yes, shockingly, it’s true! Back in November 2002, it was exposed that a company called Prodigene had contaminated fields in Iowa, after a GMO crop carrying a potentially dangerous & deadly viral strain escaped and possibly transmutated. Soya fields were planted in the same locations and tainted from remains of the experimental variety. The USDA, who granted the biotech firm 85 test permits for 96 sites throughout the U.S. Midwest, refused to identify the “escaped” crop. Instead, the USDA quietly oversaw the destruction of the contaminated fields, unwilling to damage the biotech industry with scandal, despite a previous episode of pharma-contamination from the same firm in Nebraska. The government ordered ProdiGene to burn 155 acres of the contaminated crop in Iowa in September after inspectors found stray biotech corn plants growing in the field. A similar incident occurred in Nebraska in October. And what were they pharming? A protein found on the surface of HIV, the virus that causes AIDS, for one, which was to be harvested for an AIDS vaccination. Other pharming tests conducted by Prodigene include, reportedly, an experimental oral Hepatitis B vaccine, another for a virus transmitted by pigs, another a blood-clotting agent, another an insulin enzyme, others for things like industrial adhesives. Edible GMO vaccines, tailored to the world’s (overpopulation) ailments. Scary stuff! That’s wild, mutating AIDS virus strains and/or experimental-vaccine formulas, etc. potentially on the loose! Dangerous doesn’t begin to explain this. All or some of these experimental GM may be blowing in the wind, passing along traits as it cross-pollinates the very Iowa corn fields growing our foods, and on to other fields from there. Reuters reported that at least 300 acres of pharmaceutical crops had been planted (in 2002) and companies like Dow Chemical and Monsanto were lined up to do tests. Some called to ban the experiments and jail those responsible at Prodigene, a company based in the university community of College Station, Texas. BIO emphasized that… member companies would be better off by voluntarily refraining from growing test plots of, for instance, engineered corn plants in the corn belt. However, relentless political heat, particularly from Senator Charles Grassley (R-IA), led BIO to retreat from this position by early December. The record is clear that both the companies and government regulators were aware of the potential for things to go wrong with these crops, but had an executive branch-issued priority to fast-track GMO approval in all realms despite dangers posed to the public. These entities are, without any doubt, NOT representing what’s best for the public’s safety. 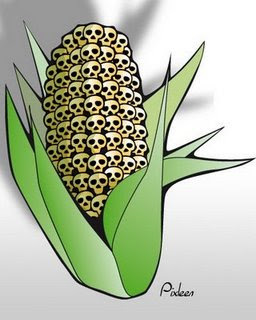 To the contrary, as The World According to Monsanto makes clear in the case of the anonymous-but-intentional contamination of Mexican heirloom maize fields that refused to adopt GM varieties, that those running the show intend to destroy traditional agriculture. That only tips towards the piracy-for-patent dominance they’ve designed to develop an oligopoly on food, medicines and etc. and prevent your access to the naturally-growing (unpatentable) varieties. This is the vision for our future now being pushed by the technocrats, who coalesce at places like Bilderberg, and who circle their money around funds like the Gates & Rockefeller foundations. The United States food chain has been contaminated by Genetically Modified (GM) maize plants used to produce a pharmaceutical or industrial chemical but US authorities are unwilling as of today to disclose what the mysterious GM Pharmaceutical maize is that was found for the first time among food crops in two US States (Iowa and Nebraska). Friends of the Earth is seeking urgent reassurance from the European Commission that food in Europe has not been contaminated. The company that produced the maize, Prodigene, carries out a range of outdoor tests on crops containing pharmaceuticals and industrial products in at least 96 locations in the US. The ProdiGene incidents reportedly frustrated the US food industry, which stated on Thursday Nov. 14 that biotech companies need to change which crops they have chosen to make drugs and industrial products. This was an accident waiting to happen. If you grow GM crops outdoors then they will eventually contaminate the rest of the food chain. We are seeking urgent reassurances that food imported into Europe has not been contaminated, said Adrian Bebb, GM Campaigner at Friends of the Earth. The US Department of Agriculture (USDA) announced on Tuesday Nov. 12 that it quarantined over $2.7 million worth of soya beans (500,000 tonnes) destined for human consumption at a Nebraska grain elevator after finding parts of ProdiGene’s GM maize mixed with the soya beans. They later ordered their destruction. USDA authorities, who refuse to reveal the chemical or drug genetically engineered in the GM maize, also claim that a similar incident happened last year involving the same company. The soya crop was planted and harvested on the same site where a GM pharmaceutical maize was grown on the previous year. Seeds dropped by the maize grew this year and contaminated the soya crop. Friends of the Earth, as part of a wider US coalition, warned the US Government earlier this year that this could happen. The coalition is now filing a legal petition demanding an immediate halt to the outdoor growing of pharmaceutical GM crops. * Trypsin – Digestive enzyme that can be used in leather tanning or to produce insulin. Other pharmaceutical GM crops reportedly grown by ProdiGene include experimental oral vaccines for hepatitis B and for a pig disease, transmissible gastroenteritis. According to USDA records ProdiGene has received 85 test permits for experimental open-air trials of pharmaceutical GM crops and chemical crops for planting in at least 96 locations. Once you start genetically engineering drugs and chemicals into crop plants then you really are opening Pandoraâs box. The consequences could be catastrophic, said Adrian Bebb of GM Campaigner at Friends of the Earth. Washington-Today, the U. S. Department of Agriculture (USDA) revealed a second incident of contamination of a food crop by an experimental genetically engineered crop, engineered to contain a pharmaceutical or industrial chemical, in Iowa. This follows yesterday’s announcement that 500,000 bushels of soybeans in Nebraska destined for human consumption have also been quarantined due to biocontamination by a similar crop. Other biopharm crops reportedly grown by ProdiGene include experimental oral vaccines for hepatitis B and for a pig disease, transmissible gastroenteritis. According to USDA records ProdiGene has received 85 test permits for experimental open-air trials of genetically engineered biopharmaceutical and chemical crops for planting in at least 96 locations. More information on ProdiGene products can be found on the attached document. “With this latest contamination the government should halt all experimental genetically engineered crops grown on farms,” Stated Matt Rand, Biotechnology Campaign Manager for the National Environmental Trust. “If the governmentm continues to develop policies for the biotech industry instead of for the safety of the U.S. food supply it is just a matter of time before one of these experimental crops ends up on our dinner plates,” continued Rand. Today, with the second contamination of an experimental genetically engineered biopharmaceutical crop, the GEFoodAlert coalition announced its intention to file a legal petition to the USDA calling for the immediate halt to all biopharms. Additionally with the US government not revealing pertinent information on the contamination incidents, the Center for Food Safety, a member of the coalition, filed a Freedom of Information Act (FOIA) petition to access all government documents on ProdiGene. A similar FOIA was submitted by Friends of the Earth in April 2001and the USDA declined to provide permit information. Last week members of GEFoodAlert coalition met with the USDA regarding the open farm testing of biopharmaceuticals and asked the USDA if contamination testing was taking place. The USDA flatly denied that any contamination testing was being performed. “The government clearly knew about this contamination weeks ago and chose not to reveal the information to the public, but instead worked behind closed doors with the industry to try to cover this up,” said Joseph Mendelson, Legal Director at the Center for Food Safety. ### For a comprehensive report on biopharm, see www.gefoodalert.org. The GEFoodAlert is a coalition of health, consumer and environmental groups that supports the removal of genetically engineered ingredients from grocery store shelves unless they are adequately safety tested and labeled. Nebraska soybeans were contaminated with engineered corn grown by ProdiGene in 2001. All of the substances involved in these trials were kept secret as confidential business information (CBI), except one that listed the substances involved as aprotinin and gp120. ProdiGene has also reported that it is growing trypsin-corn on hundreds of acres in the Midwest, including Nebraska, though for some reason this trial is not listed on the USDA’s website. The ProdiGene permit for planting in Iowa in 2001 was simply listed as a pharmaceutical without further specification. “Like any transgenic plant with pesticide properties, those containing trypsin inhibitor should be tested for their biological effects at dietary concentrations which, at minimum, are likely to be encountered in the transgenic plant itself. Such studies should also be accompanied by tests designed to evaluate how much heat treatment may be necessary to reduce the trypsin inhibitor activity to non-toxic levels.” (3) It is not known if the government has required any animal testing on ProdiGene’s aprotinin-producing corn. gp120 is a glycoprotein (protein with sugar groups attached) found on the surface of two strains of HIV and the closely related simian immunodeficiency virus (SIV). It is being grown in corn for possible development as an AIDS vaccine, though many researchers believe it will never be effective, and might even suppress an effective immune response in vaccinated individuals. Injection of gp120 into the brain of rats has been shown to kill brain cells, while injection into the human blood stream results in the death of white blood cells. It is not known if the USDA or FDA has conducted any environmental or health assessment of gp120-producing corn. It would seem advisable to test for possible adverse effects upon inhalation of or contact with gp120-corn dust and pollen. Trypsin is a digestive enzyme used in biological research and pharmaceutical processing. It is traditionally obtained from cow or pig pancreas. ProdiGene announced plans to grow hundreds of acres of its trypsin-producing corn in the Midwest this year, including Nebraska, with hopes of marketing hundreds of pounds of corn-derived trypsin by year’s end. Trypsin is a known inhalant allergen, causing occupational asthma in pharmaceutical and industrial workers exposed to it. Similar concerns might apply to farmers and farmworkers exposed to trypsin-corn dust and pollen, especially since trypsin is produced at very high concentrations in corn kernels. Trypsin corn is reportedly being grown under the USDA’s weak “notification” system, which does not require a permit. A USDA spokesperson indicated that neither the USDA nor the FDA had conducted any health or environmental assessment of trypsin corn. Another possible substance is laccase, an enzyme derived from a fungus. It is intended for use in the adhesives industry. ProdiGene foresees a market for corn-grown laccase that would require the planting of anywhere from 200,000 to 2 million acres of corn. A related version of laccase from the Japanese lacquer tree “may be harmful by inhalation, ingestion or skin absorption. Prolonged or repeated exposure may cause allergic reactions in certain sensitive individuals. The toxicological properties have not been thoroughly investigated.”(4) Other biopharm crops reportedly grown by ProdiGene include experimental oral vaccines for hepatitis B and a pig disease, transmissible gastroenteritis. There is no indication that the USDA or the FDA has conducted any health or environmental assessment of these substances. 1. Search on the following parameters: Phenotype category = Other; Institution = ProdiGene; Location = Nebraska. 2. For detailed treatments of the substances discussed below, including references, see “Manufacturing Drugs and Chemicals in Crops: Biopharming Poses New Threats to Consumers, Farmers, Food Companies and the Environment,” July 2002, by Bill Freese of Friends of the Earth for Genetically Engineered Food Alert. Available for downloading at www.foe.org/biopharm/. 3. “Mammalian Toxicity Assessment Guidelines for Protein Plant Pesticides,” Scientific Advisory Panel to the EPA, SAP Report No. 2000-03B, September 28, 2000.